Get ready! Prepare for the 2018 World Cup in Russia with the most authoritative and comprehensive preview of soccer’s greatest tournament! Officially licensed by FIFA—world soccer’s governing body. 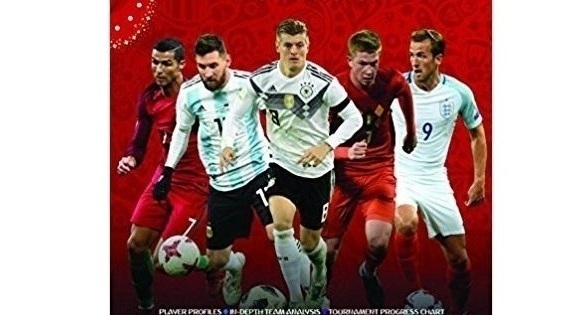 Packed with stunning photography and expert analysis of each of the 32 teams, its star players, and its prospects in the finals, this official book is essential for soccer fans everywhere. It features a guide to all 12 stadiums and 11 host cities, a history of the FIFA World Cup, and a tournament progress chart to complete as competition progresses. Whether you’re watching the games live in Russia, in front of a television at home, or with friends at a club, bar, or FIFA World Cup Fan Zone, this is the tournament preview for you. Keir Radnedge has spent more than 50 years covering soccer as an author, journalist, broadcaster, and analyst. Formerly editor of the renowned World Soccer magazine and a newspaper journalist for more than 40 years, working mainly for the Daily Mail and The Guardian in London, he regularly appears as an analyst on the BBC and Sky Sports in the UK and cable news channel CNN. His book-writing credits number more than 50, and include histories, encyclopedias, and tournament guides. FIFA World Cup Russia 2018 will be the 14th tournament finals Keir will have attended.